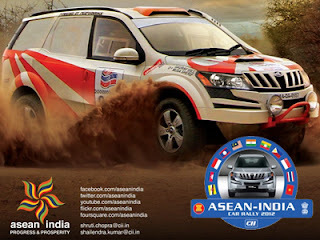 Guwahati, Nov 16 : ASEAN-India Car Rally 2012 will open up North East region to South East Asia for people-to-people contact and promotion of trade and commerce, Assam Chief Minister Tarun Gogoi said today. "The surface and cultural connectivity will bring us (NE region and SE Asia) together and promote trade with each other," Gogoi said at a press meet here in the presence of diplomats from ASEAN countries. "Economic development can take place through connectivity and more understanding achieved between NE region and ASEAN countries. Assam has a strong historical and sub-regional affinity with the ASEAN nations," he said. The car rally would demonstrate the ever increasing\ proximity between India and ASEAN countries and create public awareness of India-ASEAN relations, Gogoi said. It would also promote the Centre's 'Look East Policy' through people-to-people contact, investment, tourism, trade and commerce, he said. Assam, Gogoi said, has emerged to be the fastest growing\ state of the country. Its GDP is the second highest with the rate being higher than even the national average. The ambassadors of Thailand, Lao, Vietnam and the High Commissioners of Brunei Darussalam, Malaysia and Singapore were present at the press meet. The car rally would begin in Indonesia on November 25 and enter Assam on December 16 through the Assam-Nagaland border. The flag down ceremony would be held here the next day, said Abhijit Barooah, co-chairman of the CII North East, technical partner of the rally. This is the third time Assam would be hosting a non-competitive car rally organised by the Ministry of External Affairs (MEA) in partnership with CII, Barooah added.